I loved going to dances in South Texas, during the 1940s. Every one went, from mothers and fathers to the children. It was our social life. I lived in Wilson County, 20 miles southwest of Floresville. Every week there was a dance at Three Oaks Hall. The week before there would be one at Hobson. If there was a dance at Three Oaks or Hermann Sons Hall in Poth, my brother Lawrence and I were going to go, no matter what. 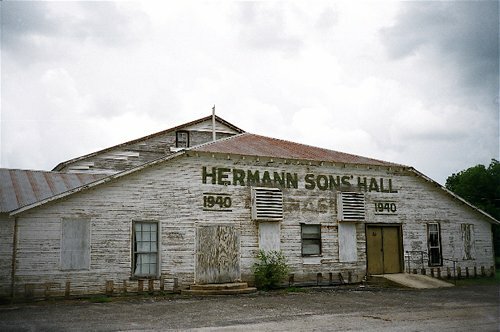 I loved going to Hermann Sons Hall best. Country-dances were popular in South Texas. When I was small, in the late 30s and early 40s, I remember going to dances at Kasper School. The band would consist of a guitar player, a fiddle player and maybe a harmonica player. They cleared out the desks and put everything in one room, opened up the big folding doors between the two big classrooms. They threw cornmeal all over the floor to make the floor slick and easy to slide on. As every one danced and danced, small children played outside and watched through the windows or went in and danced with each other. As a child, I remember standing outside on the porch and watching through the open windows as they dancers did the Cotton-eyed Joe, the waltz, two-step or polka. Before electricity came in the early forties, when the REA came through, they put up kerosene lanterns to light the place up. I loved the sound of the music and the beat of the men's boots or heavy shoes on the wooden floors. There have been dances over at Three Oaks since before I was born. My mother and father had their first date going to that New Years Eve dance at Three Oaks in 1931. When I left home in 1950, I moved to San Antonio and spent quite a few Saturday nights at Fest Hall, at the Circle B, and later on at The Farmers Daughter. Just before I got married and even afterward, when my husband and I would go dancing with my aunts and uncle and friends, we went to Helotes to the John T. Floores big dance hall. The outside patio, with it large spacious concrete floor was wonderful on warm spring, summer and autumn nights. We went to see Charlie Walker, a local singer, and even got to hear a newcomer everyone was talking about. His name was Willie Nelson. 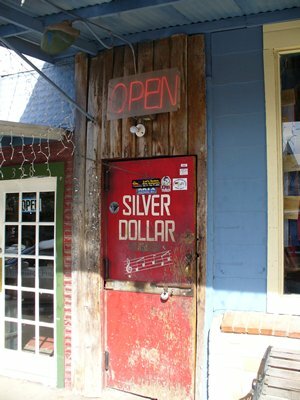 A few times I had dates to the Silver Dollar Saloon in Bandera, where we danced the night away, then drove back to San Antonio, at 2:00 in the morning. After moving to North Texas near Ft. Worth, in 1968, we even went to a few dance halls with our grown kids, who loved the old time country western dances. Our favorite was Nine Acres Club out in Colleyville. I only went to Billy Bobs in Ft. Worth one night. By then my dancing days were going by. But I still yearned for the good old days of going to country-dances. My memory has taken me back to one night long ago. It is Saturday night! It is the summer of 1948. The sun is going down in the west. It is still hot after a sweltering hot day! The temperature was still near 99 degrees. The dance halls were calling. I was 16. 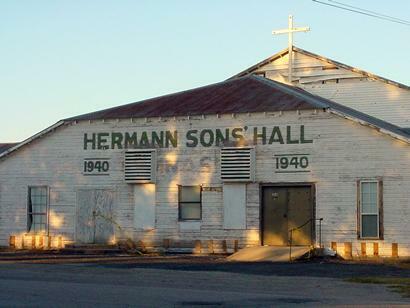 And I was going to the dance at Hermann Sons Hall in Poth. I hurried, along with my brother and sister, to milk the cows. The sweat was rolling down my face and back. I had to take a bath. Well, taking a bath at our house meant filling up the big wash tub with water which was set up in the bedroom, and then scrunch myself down in it and bathe. We had no running water. Finally I felt clean and the breeze blew in through the window to cool me off. I put on my white cotton peasant blouse and my big full pink printed skirt that would swirl around when I spun around the dance floor. I had rolled my hair in pin curls earlier in the day and now I combed it out and my hair was soft and curly. I just hoped the humidity and heat wouldn't make the curls droop too soon. I applied my red lipstick and slipped on my sandals. My brother Lawrence, only 14, drove the old gray pickup truck, and we took off in a cloud of dust for Poth. I wondered who would be there? To dance with, I meant. The boys! I knew my friends, Crystal, Jennie Lee, Dorothy Ann and other friends would be there. But, I was thinking of the boys. We drove up in the big dirt parking lot, already full with cars and pick-ups. As we walked in the door of the big white frame building sprawled out under the trees, I could hear the oompah-pah of the polka the band was playing. I smelled the strong smell of beer, coming from the bar area, and walked into the big hall. The dancers were swirling and dancing round and round the room, and I could see the walls lined with benches, people sitting there, talking and watching the dancers. My brother took off to find his friends, and I began to walk around looking for Crystal or Jennie Lee. There was Jennie Lee dancing and laughing with Paul, her boyfriend and I saw Crystal, dancing with some boy. He was happily stepping on her feet, and she was trying to get out of the way, and acting like she was having a lot of fun. But, I knew better. I sat down on the bench and waited for the set to finish, and she saw me and walked over, smiling and thanking the tall gangly boy for the dance. When she sat down, whispered that she just couldn't hurt his feelings and refuse to dance with him. I shook my head and smiled, knowing what she meant. We always seemed to be dancing with the wrong boys. The ones we wanted to dance with had other girlfriends. Finally came the time we were waiting for, the Paul Jones. That was where the girls and boys got in a big circle in the center of the hall, with the girls in the center and the boy to the outside. We all walked around in opposite directions in the huge circle as the music played, boys and girls, and then the whistle blew loudly, then the boy next to you grabbed you and started dancing. You never knew whom you would get, but sometimes I was lucky. The boy would be tall and handsome and a great dancer. I was disappointed when it was over, and we sat back down and waited for the music to start up with Cotton Eyed Joe. Now that was something we could all dance to, without a partner. It was just dancers sometimes in a line of two to six people. We danced and swayed and back stepped and front stepped for sometimes two sets, if the musicians were agreeable to doing it again. Everyone loved the Cotton Eyed Joe. The night wore on, and the heat in the hall was getting unbearable. Only big fans stirred the air, with the human bodies all hot and sweating, and dancing and moving. There was not much coolness in the place. The men and boys kept going to the bar area and going outside. They got rowdier and rowdier and every once in awhile I could hear yelling and hollering outside. Someone broke up a fight. But I didn't ever go outside. I stayed inside, even during intermission. Toward the end of the night, as I was sitting there, laughing and talking to Dorothy Ann, I could see one boy coming toward me, smiling. My heart jumped in my chest. Was he coming to ask me to dance? He didn't say a word, he just reached out his hand and I lifted up mine and I stood up. The boy I had been wishing I could dance with all night was right there before me! We "two-stepped" and waltzed around and around the dance floor, and when he put his cheek next to mine, I wanted to faint. All too soon the dance was over and he walked me back to the bench and smiled and walked off. I left the dance that night, my head in the clouds. It was the best dance of my life. The clouds were beginning to build up some in the west. I could see the darkness on the horizon and then a streak of lightening. A breeze was kicking up the dust in the parking lot. It was cooler as I got into the pickup, and my brother started it up and we drove out to the farm. We talked. I had seen him dancing one time, but he had mostly been hanging round with his friends. After all he was only 14 years old. He liked the girls, but just didn't have the nerve yet to dance with them. My brother asked me if I had a good time and I had fun and did I dance with anyone. I told him I had danced a lot and it was fun. He glanced over at me, as he shifted the gears in the pickup, and started past Schneiders Cafe on the road and headed west across the River, to home, smiling knowingly. He asked, Oh Yeah? Who did you dance with? None of your business! I said, smiling, tossing my hair, my curls gone and my hair stringy and damp and drooping down on my neck. But I didn't care. It was all worth it. I had had a good time at the dance. I wondered who was going to play at Herman Sons Hall next week. I was sure Daddy would let us go. For tonight I was happy! It looked like it might rain, and maybe it would be cooler next week!